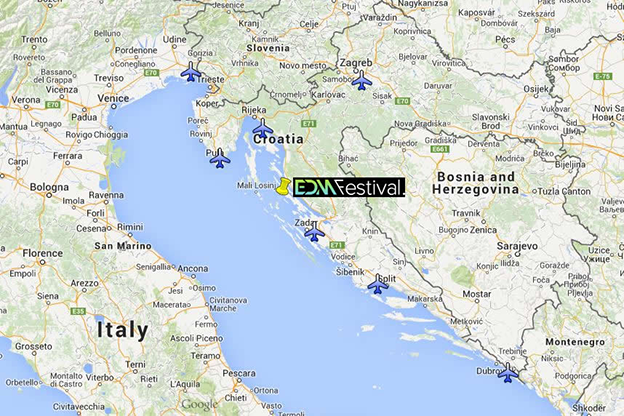 For those flying to the festival there are transfers* to the festival site organized from all the following airports: Zadar, Split, Dubrovnik, Pula, Zagreb, Trieste. Although we will take flight times in to consideration our transfers are not linked to any specific flight(s). Electro Dance Madness takes no responsibility if you miss your coach or flight as a result of delays on either side. Please note you will need to take in to consideration the time it takes to pass through customs, passport control and, if applicable, baggage reclaim (allow at least an hour for this). Arrival times are given but these are only estimated and may change for a number of reasons, including, but not limited to, traffic jams, vehicle failure & border checks. For those staying in Private Apartments provided in our official packages, please check your check-in time before your departure. If you book a transfer that arrives outside of these hours you will not be able to check-in until the office is open; we would suggest, in these instances, that you stay for a night in your arrival city and catch a transfer the next day to site. If you have booked accommodation elsewhere please check their check-in procedure before booking.